As many as 106 international exhibitors are coming to Pakistan to participate in Pakistan Auto Show (PAPS) to be held here at Expo Center from April 12 to 14. 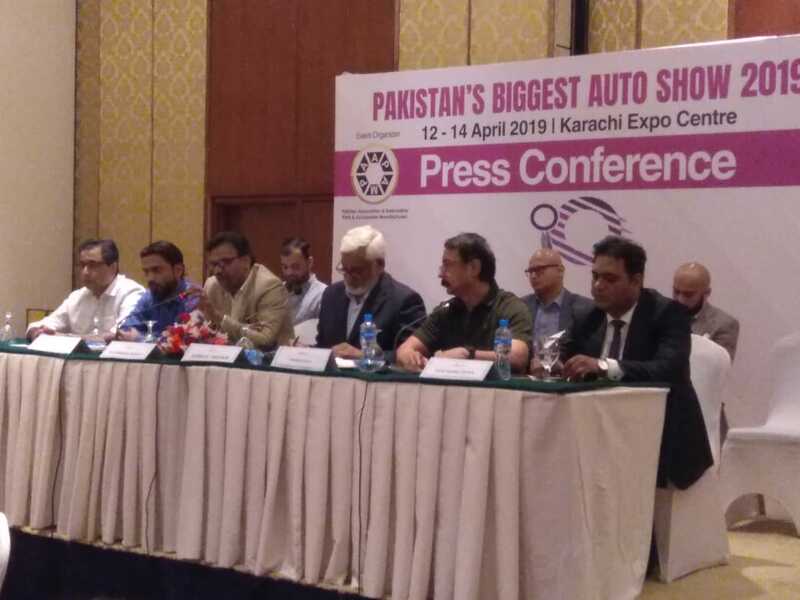 This was revealed by Chairman Pakistan Association of Automotive Parts and Accessories Manufacturers (PAAPAM) Muhammad Ashraf Shaikh in a press conference on Monday here at a local hotel to announce the PAPS 2019. Chairman PAAPAM added that total 89 local exhibitors, 28 sponsors, 03 universities, and 18 support organizations and 106 International exhibitors are part of this show. This comes to total 244 exhibitors this year. He added that the PAPS came into being to provide our industry a platform from the country to showcase its capability and potential to the world. “It is three day event with the entire Auto Engineering Sector assembled under one roof,” he added. He revealed that new entrants including KIA and Changan will be displaying some of their potential offerings to Pakistan at the exhibition. He said that government high-ups, local and international buyers and manufacturers, machinery manufacturers, raw material providers, and service providers are expected in this show. “Based on previous estimates, this year’s PAPS is expected to draw a crowd of more than 100,000+ Potential visitors from parts manufacturers, component suppliers, auto lovers and affluent automobile buyers to get a glimpse of the latest models from the world’s leading automakers in the motorcycle, three wheeler, car, tractor, trucks and buses,” he added. Head of Organizing Committee, Mashood Ali Khan said that this time around PAPS 2019 will be even a bigger show with exhibitors participating from China, Thailand, Malaysia, Korea and Netherlands. The show has further increased its penetration in the localized sector with participation from 12 of the major OEM,” he added. “We would like to develop and strengthen our international relationships which have been made after years of work. Export Orientation will be the key to introducing new and upgraded technology,’ said Mashood, adding that their objective is strengthening previous relations with OEMs and striving to increase localization content. “Another object of the association is that new avenues need to be made for our SMEs to transform into large scale companies. As the economy of Pakistan is growing rapidly, the importance of such shows becomes greater, as PAPS will be geared to invite both local and international investors, who are showing keen interest in working with Pakistan,” he said. PAAPAM has always played a pivotal role for provision of business opportunities and growth of Auto Engineering Industry as a whole. At PAPS 2019, PAAPAM has established a substantive business generation model for everyone including PAAPAM members who are not part of this year’s exhibition as well as for the representatives of the Allied Industry. Highly trained B2B professionals will be aligning their business meetings to explore synergistic opportunities. For this an exclusive business lounge will be set up as per the international standards to facilitate B2B meetings. Furthermore, PAAPAM has taken a step ahead in providing ease of operation for all of its exhibitors and will be providing free Hi Tea and Lunch for them during the complete course of the exhibition. For the first time in Pakistan, an exhibition is offering Complete Thematic Representation of Stall. Matching international standards and breaking the stereotypes, PAPS has provided the thematic stalls for all of our participants who will just have to plug and play,” said CEO Petrol Solutions, Nabeel Bin Tariq.